National Coordinator of UNDP’s Small Grants Programme P.S. Sodhi (r) at Green Haat. The festival highlights the real green economy which sustains a major part of India. India is the global host of the 2011 World Environment Day (WED), the principal vehicle through which the Unites Nations stimulates worldwide awareness about the environment every year. The WED theme for 2011 is Forests: Nature at Your Service. As part of the celebrations of the WED 2011, the Dilli Haat at INA has become the organizing venue for Green Haat: a portrait of the real green economy that sustains a major population of India. The Green Haat is being organized by the Ministry of Environment & Forests (MoEF), Government of India in association with various organisations like CEE (Centre for Environment Education), SGP (The GEF Small Grants Programme), UNDP etc. The Green Haat is showcasing India’s forest heritage by means of setting up around 52 stalls displaying forest handicraft, herbal & medicinal products and forest based food recipes. 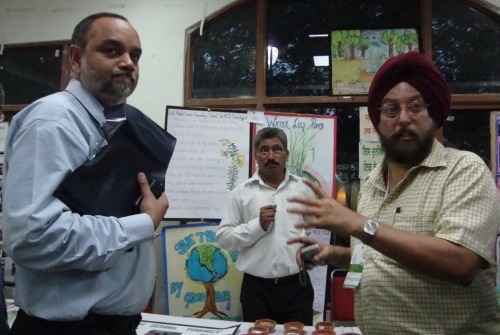 According to Mr. Prabhjot Sodhi, National Coordinator of the UNDP’s SGP at CEE, “The Green Haat is a wonderful opportunity to showcase positive environmental actions being taken for and by the people. At the Green Haat, one can share one’s knowledge and also learn so much from our traditional roots.” The underlying objective of the Green Haat is to sensitize the people and create awareness towards the sustainable use of nature and its products. The Green Haat also aims to share knowledge, skills and practices of the forest, nature and tribal living. Along with the stalls, a lot of interesting nature craft making and workshops are also taking place at Dilli Haat especially targeting school children. Dilli Haat has attracted the citizens and tourists of Delhi as being a place where one can witness the handicrafts and rural artecrafts from across India. The Haat has a strategic significance as it brings the spirit of India together on a small piece of public space otherwise built on a nullah. The organising of the Green Haat here is therefore of much significance since the sustainable and low carbon lifestyle, which has been the norm in the traditional Indian household, needs to be brought forward today. The rapidly globalizing and urbanizing world today has increased the pace of doing things. What has also increased is the pace at which we pollute, the amount of destruction we can cause and the great deal of indifference we show to all things natural. It is time we realize this and stop taking Nature for granted. The Green Haat would perhaps be a step forward in achieving that and all those who visit it will surely be rejuvenated with these facts. NextDelhi Greens To Take Forward WED Green Messages from the India Gate Rally. Literally!